Anyone who knows me (and now everyone who doesn't) understands my unique obsession and appreciation for office supplies, and more specifically, PENS! I am a hoarder when it comes to pens, and I have to admit that I have been embarrassed a time or two by the lengths that I have gone to try a new pen, and even the frequency of the office supply store visits. I literally have people who bring me pens from health fairs, expos and trips because they are aware of my deranged obsession. It is typically around the back-to-school time that my fascination kicks into high gear because everywhere I go, there they are. In my quest for the optimal writing instrument, I have only been able to find a couple of pens that are worthy enough for a subsequent purchase. There is so much that goes into my "science" of buying a new pen. First and foremost, as with most things in life, is appearance. If the pen is too "plain" for me, I'm not interested. I don't need anything fancy, but I must admit that colors, designs and interesting features have drawn me to a pen (or several). Second, and this tends to be the most important feature, how does the pen write? The thing that makes this difficult is that not all pens are on display for you to try out before you buy (but they should be!). I love a smooth, continuous, boldly performing pen. I don't have time for inconsistent ink flow, time for ink to dry or special "care" that a writing utensil needs. I truly prefer ball point pens over gel pens of any kind because I have yet to experience a gel pen that delivers as smoothly as the traditional ball point without the mess. 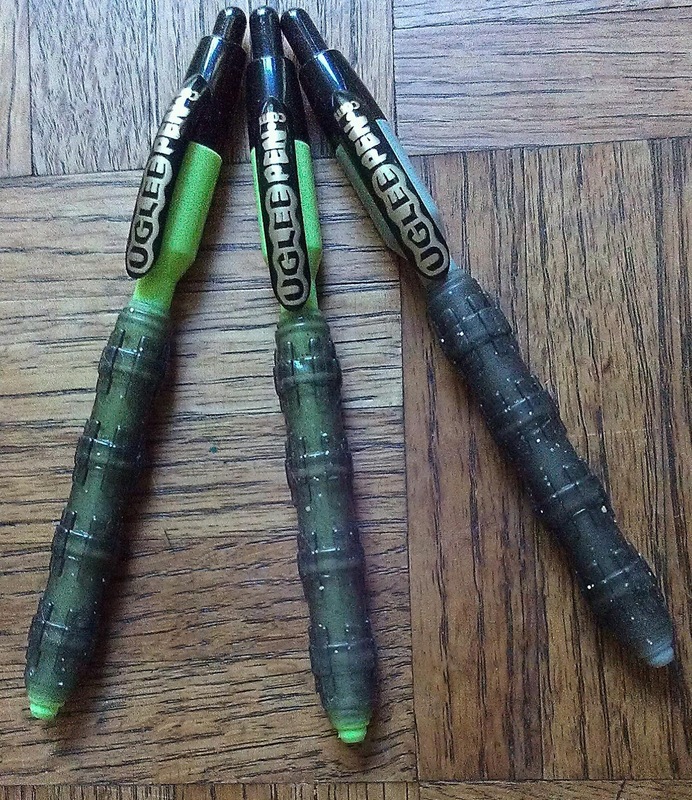 Luckily, I was recently chosen through Tomoson to try the UGLee Pen for free for the purpose of review! This pen can be described as an ergonomic pen which comes in a unique design providing comfort and support for your everyday writing needs. Whether you are simply writing your grocery list, are a child learning to write, or experience difficulty with writing due to complications such as arthritis or carpal tunnel, the UGLee Pen is perfect for you! While they are called UGLee, they truly are not that hideous. As you can see, it has a nice "grip" that runs the majority of it's length. Aside from providing a hint of sparkle, this is probably the most unique part of this pen. My 8 year old son says it best when he says "I love using this pen because of the squishy part". It has a very cushion-esque feel, and most certainly makes writing that much more enjoyable. I found myself wishing that I had known about these pens during my high school and ESPECIALLY my college years. I'm pretty sure I will have a callus on the side of my middle finger for the rest of my life, and I'm even more certain that this pen could have prevented it. I'm very thankful that I received 3 of them because the other members of my household decided that they too would like their very own Uglee Pen. Each of us loves the "squishy" grip, and how that transforms the experience of writing. Paired with the smooth, bold writing, it is truly a pen lover's dream come true. 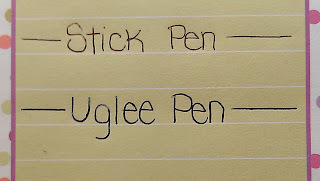 Below is a writing comparison I did with the traditional stick pen, and then the UGLee Pen. As you can see, the UGLee Pen has a bolder delivery that is consistent throughout and has the added bonus of being cushion-y, and fun to use. These definitely pass my "pen test", and can be immediately added to my list of subsequently purchased pens; a new favorite throughout the entire household, for sure! If you are interested in getting your hands on these pens (and you really should be! ), you can choose from a variety of barrel colors (i.e. red, pink, white, yellow, green, blue, gray), and ink refills in black, blue or red. To get a better look, check them out here (I am really digging the blue ones-they are so sharp!). Plus, there is a satisfaction guarantee! What do you have to lose? 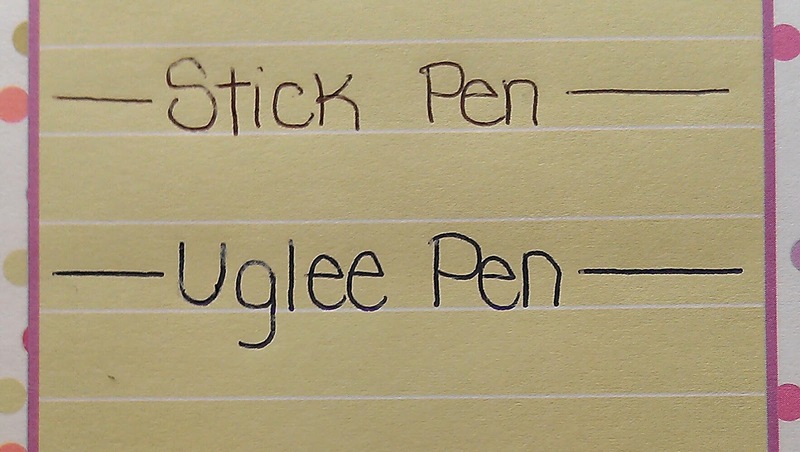 Be sure to stay on-top of news and promotions by following the UGLee Pen on Facebook and Twitter!